The 21.35 metre sailing yacht Stay Calm, listed for sale by Jeremy Peek at Nautor’s Swan Brokerage in Monaco, has had a €405,000 price reduction. 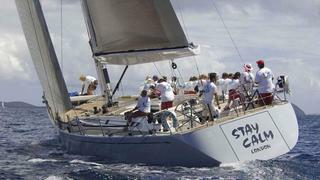 Built in GRP by Finnish yard Nautor’s Swan to a design by German Frers, Stay Calm was delivered in 2001 as a Swan 70 high performance bluewater cruising model. An interior in satin varnished teak accommodates up to eight guests in four cabins consisting of a master suite aft and two forward twins, both with Pullman berths and all cabins have en suite shower facilities. In addition, there are quarters for three crew. The main saloon of Stay Calm has comfortable fixed seating, a dining table and an entertainment centre including a large Samsung television screen and a Bose Lifestyle stereo surround sound system. The decks are safe with flush mounted Harken deck hardware and the forward cockpit is ideal for alfresco relaxation with seating, a table and a folding Bimini top. On the technical side, she has an Offshore Spars carbon fibre mast and a Park Avenue boom while her sail wardrobe comes from North Sails. A recessed Reckmann hydraulic headsail furler has controls in the aft cockpit. When racing, she has a carbon fibre spinnaker pole with removable deck fittings. Regularly and lovingly maintained since delivery, she received all new Future Fibres standing rigging in 2015. Under power, a 130hp Cummins engine gives her a cruising speed of 9 knots and the engine space is sound insulated and fire resistant to SOLAS standards. Lying in Southampton, Stay Calm is now down to €1,195,000 with VAT paid.